I caught this news clip online yesterday. The smiling blonde face in a helmet looked like my daughter in Afghanistan and I had to stop and watch. I knew the story. I even knew the dust the one soldier described. But seeing it told in this way especially by her mom-I was deeply touched. 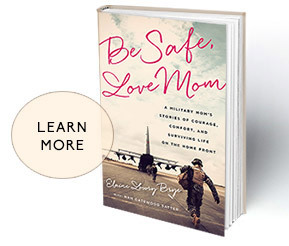 In “Be Safe, Love Mom” we tell the story of a Lioness-a female Marine who accompanies a combat team from house to house dealing with the women- from her mom’s point of view. I supported that mom throughout her daughter’s deployment and celebrated with her when her daughter came home just like I did when mine came home. But not all of our girls came home. It only takes a visit to the Women’s Military Memorial at Arlington National Cemetery to remind us how many have given all just like Ashley White Stumpf. We moms have a special bond because we know how it feels to send a child off to war. We have no guarantee that they will return to us as the whole and perfect child we raised. We live with that thought every day. It creates a connection between us as we stand together to support all of our children in service. And when one falls we all weep. They all belong to us. As the publicity swirls and memories surface I would like to offer our collective condolences to Debbie White-another Ohio military mom. Your grief is not new but I am sure sharp edges will appear as you retell your daughter’s story. We want to put our arms around you and all of those who grieve. Your daughter’s service and legacy are not forgotten by the Sisterhood of Military Moms. We weep for all who mourn-you are not alone. our love, prayers, and sympathy Debbie! May the Lord hold you, give you His peace and His strength! I am so very sorry!